This is a little job I carried out recently. I'd fitted this small propane heater last October when the weather started to get colder - just in time as I remember. 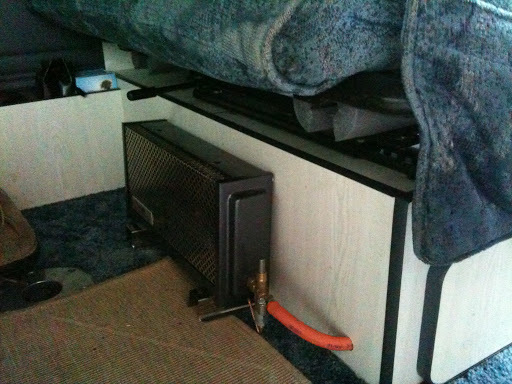 I'd discovered that the Mikuni diesel heater wasn't going to fulfil my van living needs. It just had too high a drain on my camper battery for regular use so I opted for the gas one. However, it was now time to make things a bit neater in the van. 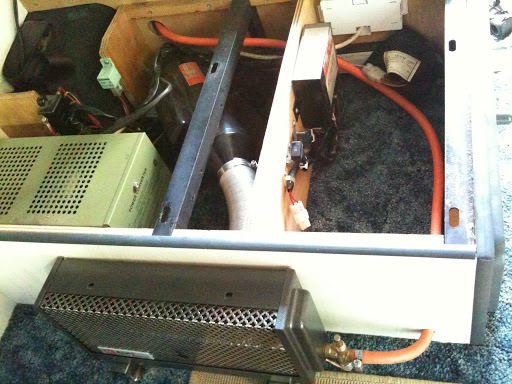 I'd been living for a few months with the gas hose loose on the floor - this was handy enough, as I could move the heater from the kitchen to the living space, but it was underfoot, and it blocked cupboard doors from opening properly. In a small space this can get frustrating, so I pondered on how to best position the heater, and route the gas hose through the structure. It took some time but I came up with a good solution. I drilled out some inch diameter holes and ran the orange hose from the gas bottle, through the back of the cupboards and under the rear seat. The heater then sits neatly just where my feet will be in the living space. (You can see the original Mikuni heater directly behind the gas one in the pic above too). The heater now neatly in position. I made a hole just about big enough to get the hose through where it comes into view again to complete the neat job. I can also still move the heater 180° if I need it on when the seats are folded flat, and, no more tripping over the hose or jammed doors! Diary: Today I had a quiet shift at work in the morning and after work met some friends for a great Indian meal in the city centre. We were chatting about next weekends trip to Donegal and we now have three more potential wild campers/swimmers/kayakers/sea fishermen joining us. Good news. I'm now settling down before sleep, rain just beginning to fall, and sounds of a steam train's whistle hooting across the river at the station..
What do you think is the best heating system for a camper van? Have you had better results than me from a diesel heater? Share your thoughts below. Do subscribe for updates, and why not check out the YouTube channel? Click the tab above.